Inbound marketing is a strategy that benefits your business and due to it’s less invasive approach it won’t annoy potential and actual customers as much as previous marketing efforts. There are loads of different marketing tactics, but for inbound marketing it boils down to the idea of turning traffic into visitors, into leads, into customers and ideally into repeat customers. Leads are very important when it comes to growing and developing your business, and for any type of marketing effort they’re completely necessary. Inbound marketing can benefit your business and it’s something to utilise to promote your content and work output. Best of all, inbound marketing doesn’t irritate and it’s not as invasive as traditional outbound marketing efforts. Many of the outbound marketing methods such as email, direct mail and telemarketing, have been dubbed ‘interruption marketing’ because they directly enter people’s lives. 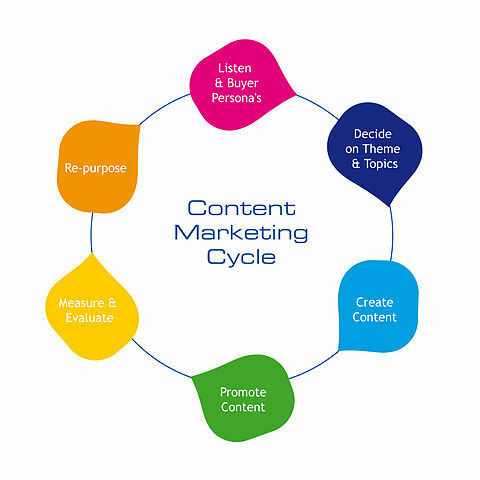 But inbound marketing methods, sometimes dubbed ‘permission marketing’, like content marketing and social media marketing, have proved popular because they allow the customer to come to you at their leisure. Whilst traditional outbound marketing methods still work (or else they wouldn’t still be used by anybody), they can easily be seen as invasive and as such self-defeating. Think about it – would you rather have your email inbox filled with dozens of marketing emails or would you rather have access to a blog or social media page filled with well-researched, interesting content? To explain this further and to help make your lead generation tactics more successful and less intrusive, here is a run-down of the four simple steps of inbound marketing. It’s not just about posting content to your site and loads of copy won’t be enough to generate traffic. It has to be good written work and there has to be a compelling reason for users to return to your website. Half-hearted copy may be easy to generate but it won’t direct anyone back to your company’s website because it isn’t distinctive or representative of anything. Anybody could blog about why Grumpy Cat is so grumpy. You must keep in mind your target audience and consider what it is that would get them more interested in you. Knowing your audience better means that you will write copy that’s more directed and in turn increase traffic onto your website. If you’re a DIY company you might want to blog about power tools. Whatever you do – make sure it’s original and hasn’t been done before. This will help to define your brand and ultimately increase online visibility. Remember to write about what you know, pander to your strengths, and make sure your content reflects your business identity in a flattering light. Furthermore, it’s important you ensure your website is SEO-friendly. If it isn’t enriched with keywords (use Google Adwords Keyword Planner tool) then it may not appear very highly in search engine results and will lag behind your competitors’ sites. You need to also do this for any blogs and social media pages you create, so that you can maximise how many people come across you when searching for a particular thing. Do be careful pursuing SEO tactics and make sure that the work that you’re developing is not just for traffic generation purposes. SEO is a tool to be utilised and you should be careful saturating your work with keywords. Remember it may be more easily searchable and in turn easier to find but if it’s bad copy it’s not going to entice readers back to your site. Content must be good, rich and detailed, and it’s worth remembering that Google picks up on SEO that’s written for the sake of traffic and won’t promote that work. Make sure that your writing is something that you’re proud of and use SEO to promote that work – don’t just write for a keywords sake. This is a very simple step. When people have now landed on your page, you need to find a way to keep them on it and sustain their interest so that they are happy for you to obtain their details. Consider giving them a sign-up offer such as free delivery, a free gift, or perhaps even a discount in return for them handing over their email address and other contact information. All you have to do is think of a suitable incentive that your target audience would react positively to. Value exchange is something to bear in mind and it’s a simple enough concept. It involves the exchange of information in return for free services – think social media networks. It turns out that consumers will give up their private details for a better user experience. Utilise this to your advantage and remember that people don’t give up their personal live to a company database without an incentive that suits them. This is the trickiest step of inbound marketing and it’s certainly the most arduous. To secure enough trust, and to make sure that your leads wish to buy something from you, you need to interact with them via your social media pages and post regularly. This will ensure that they don’t have enough time to forget your business and its products and services. Always make sure your pages are up to date and consider sending out the occasional email which contains a bespoke offer that’s only available to those who follow you. Nurturing your leads is even more important than securing them in the first place. Always be honest with your leads and admit whenever you’ve made a mistake and don’t ever rush them into doing something, especially if it’s not something they’re likely to be interested in. Give your leads time to make their own decisions – they’ll appreciate not being heckled. The whole point of inbound marketing is that the customers come to you – so don’t inadvertently turn your inbound marketing into outbound marketing by being too in-your-face. This is almost entirely dependent on the experience you give the customer post-sale. Once someone has parted with their cash, make sure you deliver on time, speak to them appropriately in all your correspondence, and invite them to leave feedback afterwards. Once somebody has left feedback you should consider responding to it, regardless of whether it’s good or bad. Showing that you care about what your customers think is often enough persuasion for somebody to buy from you again. The importance of good customer service cannot be over stated. You mustn’t forget about your customers after they’ve given you their money. If they never hear from you, why should they consider buying from you again? Never treat your customers like numbers because that’s when you start to lose sales. The happier you make a customer, the more likely it is they’ll tell other people about you, which will do a good proportion of your inbound marketing for you. Inbound marketing is a more ethical advertisement for your business. Instead of chasing down leads and irritating potential and actual customers, give them the chance to seek you out and choose to use your business. More autonomous customers can only be a good thing and the positive word of mouth they spread will only benefit your business.